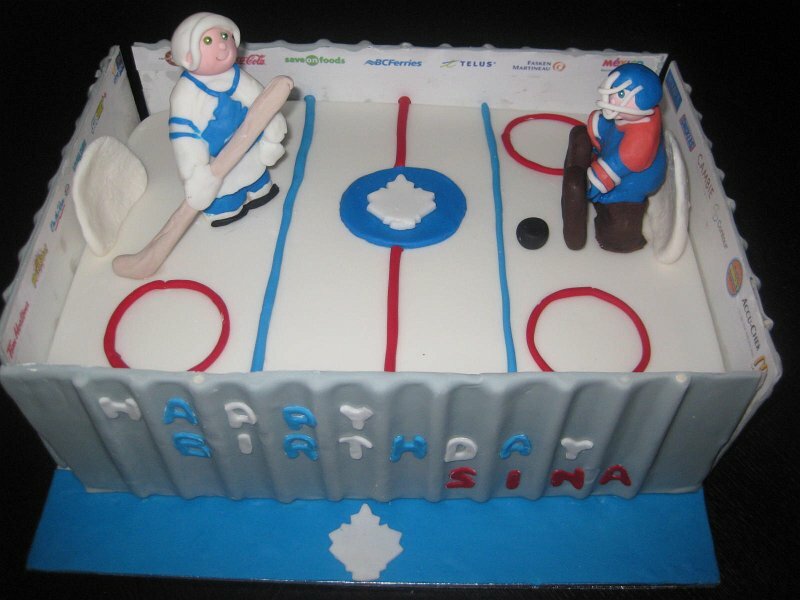 Happy 1st birthday to my hockey career. The first post on this blog was published on January 19, 2011, written on January 18. At that stage, I believe I had been skating for a full two weeks. In other words, that means it’s now officially been a year on the ice. I was reminded of this today when Melbourne baked under 38 degree heat (it later made 39.4) and I caught every possible red light, as is standard, between Fitzroy and the Icehouse, en route to my first post-Christmas skate. Standing in the Icehouse café, looking out at the ever evocative view of weeds and the underside of a freeway overpass, heat shimmering, I suddenly suffered intense déjà vu. On either my very first day of skating, or one of the very early ones, one year ago, I had looked out that same window and laughed, that it was 38 degrees (fry-an-egg-on-the-bitumen weather; although nobody has ever adequately explained why the hell you would do that) and, holy crap, I was ice skating. 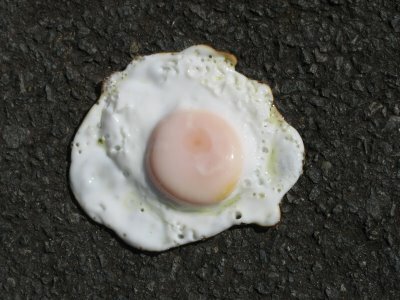 Egg fries on road: why? Back then, I was strapped into rental skates and God, was I wobbly. I actually have a dubious video from that time and it’s hilarious to watch me trying to skate nonchalantly past the camera right up until my balance leaves me and I almost stack, inexplicably, right in front of the lens. But just catch it and wobble by. Looking smooth, champ. I’d like to think I’ve improved. In fact today, at the very crowded general skate session, Jason the maybe-ex-goalie and I pondered whether we were among the better skaters on the Henke Rink … if you removed all Canadians, and figure skaters, and kids under 20 who have no fear, and … well, you get the idea. We were definitely in the top 50 per cent. Actually, Jason has been skating a year longer than I have, so maybe it’s unfair to drag him into my bracket. Anyway, who cares? It was so good to be sliding around that rink again. I hadn’t skated since a Come & Try session in late December (see Come & Die) but I didn’t suffer rust at all. Watching the excellent HBO doco: “24/7 – Towards the Winter Classic“, you hear the Rangers and Flyers players grumble about heavy legs after a plane flight, or after a couple of days off. It’s standard to read in the US press that my Red Wings skated badly because they hadn’t been on the ice for a whole 36 hours or something. It’s like their ability to skate is as vulnerable as a candle in the wind or something. Me? More than a fortnight off the ice and I’m proud to say I’m as mediocre but mobile as I ever was. I even did a few slow motion pivots and worked on the endless quest that is the turn-to-the-right hockey stop, to prove I hadn’t lost (hmm, or gained) anything over the break. A general skate in 38 degree heat is no place to try anything fancy; with every Melburnian not smart enough to be at the beach crowded onto the ice. It’s hard to get any pace up, but that was fine, as I got my legs back and chatted, gliding around. I saw a guy who I thought was an old school, friend, Daniel. Well, it looked like Daniel. And thought about a full year of this crazy hockey quest. In the first ever post (Setting the scene), I declared my intention to be some kind of hockey player and that hasn’t changed. In fact, with a strong Icehouse and Facebook Rookies community, all urging one another along and developing at our own rates, many of the players I started Intro with almost a year ago are now playing for teams and I feel confident that the goal a group of us have, of forming a team ready to join summer league next September, is very achievable. And I should be proficient enough to play by then, or something has gone horribly wrong. Who knows, that might be the major injury I predicted in that opening blog, or it might be that a new deadline, to finish a commissioned novel (one I haven’t written a word of yet) by October, could get in the way of training. But tell me that’s not a good problem to have. Or it could be another planned visit north in February to dive with manta rays at Lady Elliott Island will lose a week of training, but again, bite me. If you haven’t dived with manta rays, at the southern end of the Barrier Reef, with whale songs filling the gaps between your scuba breaths, then you have only lived to an extent. It’s the biggest thrill I ever got (apart from doing a dance called the crocodile rock). I can definitely afford to lose a hockey week for a reprise. And so 2012 begins. Reading back on the first blogs from a year ago, I marvel at how terrible I was, and how far I’ve come, when it so often doesn’t feel like it. Today I gave advice to a woman about how to walk on her skates off the ice, and how tight to tie the laces; things I don’t even think about. A year ago, I did constantly. Don’t get me wrong. I have so much work to do, so much training to be able to slap shot, or one-time, or flick a wrist shot, or genuinely pivot at speed, or skate backwards with enough speed and confidence to defend against charging forwards. But it will come. A year ago, I had nothing; could literally barely stand on the ice. When I think of how many great people I’ve met over this crazy hockey year, and how much sheer fun I’ve had, there is no question about it: I’m a hockey player and 2012 is going to see me find my team. Who knows: it might even be Bennie and the Jets. Oh, and Happy New Year, hockey fans. Thanks for continuing to read the blog. I hope Year Two continues to entertain. been reading your posts, after linking from detnews.com – very interesting reading! crazy meeting die hard wings fans from across the globe! Hi Tim. Hells yeah! Let’s go Red Wings. There are a surprising number of the winged wheel jerseys around when our local team, the imaginatively-named Melbourne Ice, plays in the AIHL. The crowd is always littered with various NHL jerseys and Detroit is strongly represented. Given how far away we are, it always sort of surprises me too.